What is Haritaki | Terminalia chebula? 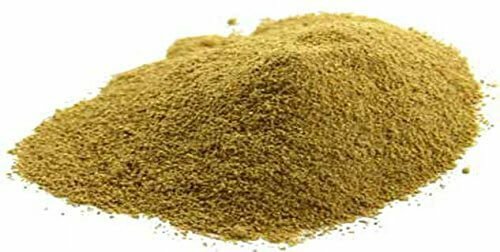 Haritaki (kadukkai podi) is an Ayurvedic herb derived from the seeds of the Terminalia chebula tree. It is commonly consumed in powder and capsule form because of it’s remarkable ability to prevent and treat diseases, boost the immune system, and increase cognitive functioning. View full Haritaki health benefits here. Production. The Terminalia chebula tree is harvested in the fall, the seeds are then dried into Haritaki Powder. Distribution. The Haritaki seed (or “fruit”) is part of the group of plants called Myrobalans. The myroblan trees are distributed throughout India, Nepal, Thailand, and South East Asia growing up to 30 meters tall and producing thousands of Haritaki fruit each season. History. In India, Haritaki has been consumed for over 7,000 years as a traditional herbal medicine in Ayurvedic, Buddhist, and Hindu traditions. It is also currently taken by hundreds of thousands of people worldwide on a daily basis, and at the center of many scientific studies regarding it’s health benefits. Regular Haritaki users at Nithyananda Peetam. Founder of Haritaki.org (Dheera) middle center. Haritaki Plus. Haritaki Plus is a pure form Haritaki used in daily consumption. It contains no processing contaminants, preservatives, or additives – and it is also USDA-certified organic, vegan, 100% natural, gluten free, sustainably sourced, and fairly traded. Buy Haritaki Plus here. Ayurveda. In the Ayurvedic health system, Haritaki is referred to as the “King of Herbs” and is listed first in the encyclopedias of Ayurvedic medicine called the Charaka Samhita. This and other dictionaries of herbal medicine list Haritaki as useful for healing every ailment. This shows the importance that they Ayurveda system puts on Haritaki. Buddhist Medicine. In the Buddhist system of medicine, the Medicine Buddha is considered the major healing deity. The Medicine Buddha does not just heal; he also bestows higher consciousness on to the people who ask for his help. The Medicine Buddha holds Haritaki in both hands in paintings that are made of him, particularly those from Nepal and Tibet. Haritaki is recommended for all ailments and is a prime ingredient of all the medicines used in Tibet. Sanantana Hindu Dharma (Hinduism). The current spiritual leader of Hinduism recommends all of his followers to take 1 teaspoon or 5 tablets of Haritaki |Terminalia chebula on a daily basis. Hindus frequently use Haritaki to increase blood oxygen levels, cure diseases, and gain access to extraordinary spiritual powers. In addition, there is currently a huge demand for Haritaki among the masses for both disease prevention – but also for more spiritual side effects Third Eye Awakening. 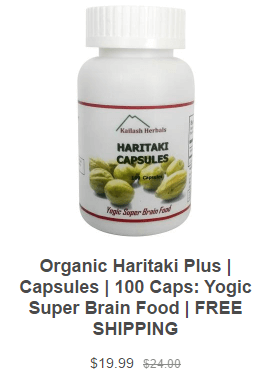 Haritaki has been renowned as the “King of Herbs” and the only herb in the ancient Ayurvedic directory of thousands of herbs to “Increase Brain Function”. Haritakis’ s use for that purpose has fallen into disuse until the last few years. The revival of Haritaki for its true and more profound benefits has been spurred by the incredible results that are emerging from India from its use. These discoveries were initiated by Paramahamsa Nithyananda, the south Indian enlightened master.Thousands of adults and young people, who consume Haritaki daily, are displaying remarkable intuition and third eye awakening abilities, and demonstrating these powers through reading while blindfolded. On this site, we share information about these developments. We provide detailed history, medical research and scientific information, as well as the most esoteric information available, as we come across it. Haritaki comes in two major forms, Haritaki powder and Haritaki capsules. We recommend the Haritaki capsules, which can be purchased on this page. Haritaki powder can be very bitter with a very strong taste that most people cannot enjoy. We are delighted to share Haritaki Plus with you, if you have questions please reach out to us. 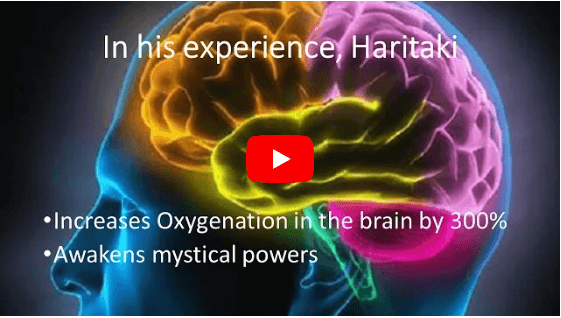 Sign up for the newsletter and receive the e-book: “How to Use Haritaki Plus, in Conjunction with Opening 3rd Eye Exercises”. 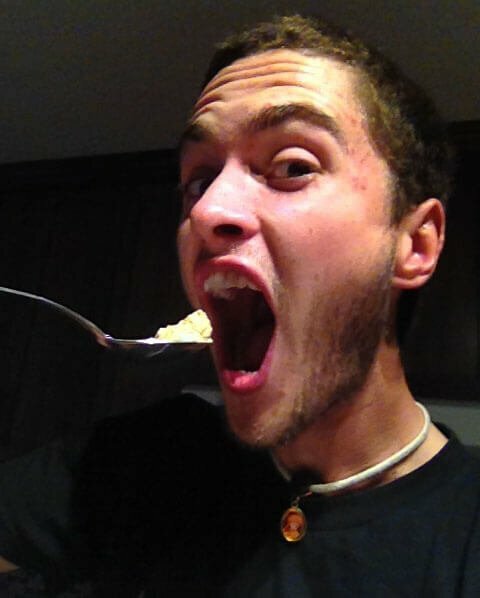 User submitted photo: Consuming Haritaki every night before bed. My, Martyn Williams own discovery of Haritaki goes back several years. I was at the ashram of Paramahamsa Nithyananda in the small town of Bidadi near Bangalore, India. Nithyananda had just been appointed as the next head of the oldest monastery in South India, in the town of Madurai. He had used Haritaki as a child, growing up in his native village, but had not used it extensively since then. While in Madurai, Nithyananda found that the monastery had been using Haritaki for over 1500 years as a spiritual practice. It was recognized within the organization as highly important for the continued spiritual growth of the leadership of the monastery. When Nithyananda began using once again Haritaki on a daily basis, and observing others who had been taking it for some time, he saw remarkable results. He observed that his level of oxygen flowing into the brain was increasing, and saw that it reached to the level of three times the normal flow. He had never witnessed this with the use of any other herbal or fruit product. The other effects he observed were a re-wiring of the brain. He observed that neural networks that were connecting negative emotions and memories of negative events were becoming weaker with Haritaki. This is obviously a massive benefit. Typically, psychologists and brain researchers say that we have 90% of negative thoughts running through our brains on any given day. When this mind noise is reduced we become much more able to process thoughts that are creative and proactive. Not only does this positively affect our day to day functioning; ability to do tasks, and our overall happiness, it releases brain capacity to be used for other functions. Brain function increase using Haritaki, Terminalia chebula. As I point out above, this herb has been credited with massive changes in brain function. These changes also result in an increase in mystical abilities. The results of these changes have been noticed to produce the following outcomes: Thousands of adults and children are expressing the ability to read blindfolded. I was recently at a 21-day meditation retreat in Thailand with 800 people attending. We were introduced to children who take the yogic super brain food on a regular basis. These children displayed remarkable spiritual powers. They were able to read through a blindfold quite comfortably, at a pace equal to an adult reading with their physical eyes. Given different books in different languages, they were able to spell out the words, even though they did not know their meaning. Blindfold vision expands to extraordinary levels. I had the opportunity to test and film some of the children who can read blindfold. This is what I saw. They could make complicated jewelry necklaces using a variety of tools while blindfolded. Even sharing the tools and chatting about needing tools that were 4-5 feet away from them. I set up a treasure hunt for 3 of the children. While blindfolded, they ran through rooms full of furniture with ease. They were able to read continuously changing headlines from websites such as CNN news. They then were asked to find a car with a particular California license plate number in a parking lot that had about 40 other cars. They ran through the parking lot reading off the last few letters or numbers of the license plates. They then spotted the car with the correct license plate, from approximately 40 feet away, and ran to it to confirm it. I asked one of the children if she could read through a double barrier: a blindfold and a sheet of paper. She said that she could. As we picked up paper for her to read through, she identified that we had inadvertently picked up multiple sheets of paper. She was able to read words through a thick blindfold and also a sheet of paper. These same children have been tested for IQ levels. As a group they are found to average at the 130 level, which is far above the average of 90-110. 130 is considered to be in the gifted range. In terms of memory and retention of words, they also perform at an extraordinary level. The normal performance of short term memory is 7 words, plus or minus 2 words. The children taking Haritaki regularly can remember 20-30 words and some can remember as many as 120 words. This puts them in the category of Guinness world record holders. As a group, the children are academically 3-5 grades further than their age indicates. For instance, the 3 children that I filmed were 10 years old and performing academically at 10th grade level. Some of the children are able to read objects in the next room through a concrete wall. Some have demonstrated the ability to read through metal, specifically, through the doors of a locker, the type used in schools for children to keep their books and clothing in. Some adults and children report an increase in their ability to scan bodies and identify illnesses, ailments or the early symptoms of disease. Some have demonstrated their ability to predict what a person is likely to experience and do in the next few days. From my own experience of taking Haritaki I feel an increase in clarity. My wife reports that I have more energy. I sleep less and take on more projects. She reports that I move through the projects with increased grace and speed. 1. Day one: Eat poor quality food, such as junk food. 2. Do not take Haritaki that night. 3. Day two: Test your ability to understand a complex spiritual concept or take an IQ test. 4. Day three: Eat lightly throughout the day and at night take Haritaki. 5. Day Four: Apply the same test…take an IQ test or test your understanding of a complex spiritual concept. Nithyananda reports that most people doing this evaluation, experience a huge difference in their understanding and ability to cognize deeper truths when taking Haritaki. The same applies for the IQ test. Most people report that they see an increase in their IQ scores when they reduce the junk food eating and include this yogic super brain food in their diet. When Nithyananda was a child he had three enlightened teachers who he would learn from. Two were very strict and would ensure that he applied himself to the spiritual studies very diligently. When they were to teach him high level concepts from the ancient scriptures, they would make sure that Nithyananda had taken daily Haritaki before the instruction could begin. As Haritaki can have an unpleasant taste, he asked them why was he required to take Haritaki when other students were not. They informed him that it was imperative that he understand the deepest meaning possible of the scriptures, as he was to teach the whole world these deeper truths. Ancient use of Haritaki. Ayurveda is the science of excellent health that has been developed by the Rishis, sages, yogis and saints of India. There is evidence that this science was developed up to 7,000 years ago. In this methodology there are many approaches to healing, curing and increasing health. In fact, health is defined in ways that, in the West today, we would find extraordinary. The ultimate health is described as a one where we live to 300 years, health free, and with an enlightened consciousness. To achieve this, there are many recommendations. Haritaki comes from the tree Terminalia Chebula, which has 7 main varieties in India. The tree is found throughout much of India, Asia and into the foothills of the Himalayas. The best varieties of the herb are found in the mountain region near Varanasi. The fruit has been harvested for eating and other human consumption uses. It also has a history of being harvested for use in leather tanning as the fruit contains tannin chemical. We source our high-quality Haritaki from organic farmers in North India. Before we discuss Haritaki and enlightenment, we need to understand what enlightenment is. Enlightenment has been described and defined in many different ways. My definition may differ from others, and feel free to add your comments and suggestions at the comments portion at the bottom of the page. Enlightenment for me is the ability to be in joy, bliss, ecstasy seven days a week and 24 hours per day. In this space life is a constant flow. Events happen that can be unexpected, that can be even physically painful but the inner space of joy remains. Events that would have been emotionally shattering before the space of enlightenment, now become events that touch the heart and increase compassion. For instance, the death of a loved one could have been devastating and debilitating previously, but now the passing of a loved one only sparks feelings of love, deep appreciation and more joy. There are many paths to enlightenment. I recommend meditation and following the teachings of an enlightened master. Why try something on your own that others have mastered and are able to guide you through? If I use the analogy of wanting to become a brain surgeon, why would you consider experimenting on your own, or why bother spending time studying with a book only? Another option is to train with a regular General practitioner. That is not going to get you very far either. Even studying with a heart surgeon is unsafe. Go for the best training that is proven and available. Anything else is illogical. How to find an enlightenment teacher? My recommendation is that you check out a number of teachers from different traditions and see what resonates with you. One easy way to review the field available to you is to use YouTube. You can find many videos of different teachers, easily and quickly, and find which one resonates with you. If you need additional help, one suggestion is, at bedtime ask for a dream or clarity on which teacher is right for you. Many people report that using this method they have received clear and direct information on who to spend time with and what their next steps are. The way that a number of enlightened masters explain this is, that by exploring and meeting different enlightened masters you are collecting a bouquet of beautiful flowers. Each flower is different and unique. Having collected the bouquet, it is then useful to enjoy and smell the flowers. The next step is to spend time with one flower. Enjoying its benefits. This way you get the benefits of that teacher working on you in their unique way. They know what needs to take place within you, in areas that you are unaware of. If on the other hand, you do not spend time with one teacher but instead you mix and match teachers and techniques, you run the risk of choosing techniques that you like, and avoiding those that you actually need! Ingredients of Haritaki that have been identified as helpful for eradicating illness. Haritaki has been researched for ingredients that are helpful in the treatment of various illnesses, to verify the uses that have been ascribed to it by Ayurveda doctors.The list of ingredients is extensive. Many of these ingredients are recognized as having healing properties including: anticancer,antibacterial, anti-diabetic, and antioxidant properties. Each batch of Organic Haritaki is scientifically tested for purity. Haritaki has been researched extensively and is completely safe to use. It is vegetarian so it is completely suitable for vegetarians and vegans. The capsules that are used for the product are vegan. The product has not been tested on animals nor are there any animal ingredients. Haritaki is completely safe and non-toxic. Haritaki does not absorb heavy metals, it is therefore uncontaminated by heavy metals. Kailash Herbals, 9550 Fremont Av #8C, Montclair, California, 91763. USA 909-652-1418.